[Infographic] Is SEO Or SEM Better For Online Marketing? Search engine marketing (SEM) and search engine optimization (SEO) are fundamental to online marketing, and though both are shown to benefit business immensely, they’re not the same. SEM is geared more toward paid search, and SEO is used to drive website traffic through keywords and linking. The online marketing industry is booming, and there are thousands of companies who need employees with SEO and SEM marketing expertise. Google AdWords has become the most highly-preferred paid search platform. In the third quarter of 2017, 91 percent of all mobile searches were performed via the Google search engine. (3) Trailing right behind is Bing Ads, which is a paid search platform designed to display ads on Bing searches. It also delivers ads to the Yahoo search engine. Think of paid search ads as virtual billboards. Just like in the real world, businesses pay to have their brands advertised, and there’s a limited number of billboards available. Billboards in prime locations cost more money, and the same applies to virtual billboards. The higher the search traffic for a certain keyword or phrase, the more it costs to rent a space that appears alongside the keyword’s search results. Paid search ads are displayed on search engine results pages (SERP). Companies vie for the top and most prominent spots on the SERPs. Having these spots maximizes visibility and is likely to increase click-through. Pay-per-click, or PPC, is when businesses pay a fee each time one of their ads is clicked. Basically, it’s a way of buying visits to a site rather than attempting to “earn” those visits through organic searches. Affiliate marketing: can appear on many online platforms, including search engines, targeted content sites, price comparison websites, etc. Search engine marketing serves a very important purpose: it places your products and services in front of a targeted audience. This audience is motivated to make a purchase and is pinpointed by creating a buyer persona. SEO uses strategies to optimize a website to organically increase its search engine results page (SERP) rankings. More so, it seeks to drive free traffic to your website, and it plays a vital role in online marketing that can boost the ROI of SEM and PPC efforts. On-site SEO: applying rules and tactics on your own website or blog to increase traffic. Off-site: boosting traffic to your website or blog by garnering backlinks from other online sites. Off-site SEO: The more high-quality websites that link back to your site, the better. Having 10 low-quality sites linked back to your content isn’t nearly as valuable as only two from Forbes and CNN. Social sharing, high-quality backlinks and social bookmarking make up the backbone of a riveting off-site SEO campaign. On-site SEO: When carefully curated, on-site SEO content helps search engines place a website in front of its targeted audience. Everything from titles to image tags to meta descriptions are extremely important. On-site SEO tactics include optimizing page load speed, integrating social sharing buttons, properly formatting URLs, tailoring content around the use of natural keywords and much more. Does CRO Impact SEM and SEO? Known for being the new kid on the block, CRO, conversion rate optimization, seeks to envelop conversion as the highest priority when optimizing a page. (8) Often referred to as landing page optimization (LPO), CRO is fundamental and can be used as a cornerstone to boost SEM and SEO efforts. SEO can greatly benefit from PPC and paid search marketing research, and the same applies to CRO. Any information amassed from CRO testing needs to be applied to SEO to ensure the PPC ad clicked on directs the user to the most appropriate page. More specifically, so that it lands them on a page likely to increase conversion rates. You cannot fully understand SEM without taking note of mobile search. About 52.2 percent of all global Internet traffic is conducted via a mobile device. (9) Fifty-seven percent of all domestic Internet traffic in the United States stems from a mobile device. SEM is largely impacted by mobile search because it requires brands to design websites and ads that are responsive to mobile devices. If a website is not mobile-friendly, then SEO efforts are ultimately in vain. And if PPC ads aren’t mobile-friendly, then the SEM campaign is severely hindered. Google recently switched to a mobile-first index tactic, meaning its SERPs are based on the mobile versions of websites. (10) Even when a user performs a desktop search, the mobile version of a site is considered first when developing SERPs. Responsive websites used to be viewed as a luxury for big brands. Now, they are a necessity for all brands. 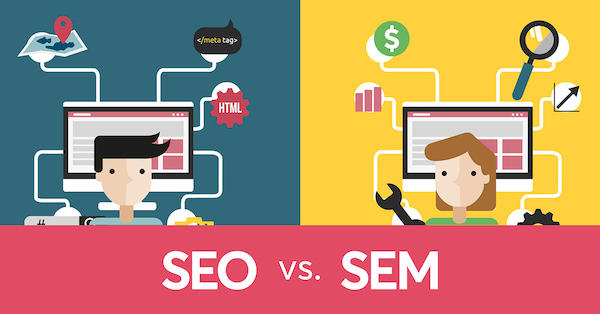 Should Marketers Use SEO or SEM? Many marketing experts are die-hard SEO fans. By 2020, SEO spending is expected to reach an all-time high of $80 billion annually. (11) To say that SEO is better than SEM is like saying a scissors are better than tape; it all depends on the goal. Creating a solid marketing strategy that boasts key performance indicators (goals) is crucial to knowing whether to implement SEO or paid search tactics. Because search engine algorithms are constantly changing, online marketing methods must be incredibly flexible and adaptive. If you have a passion for online marketing and helping companies expand their brand awareness, a degree in digital marketing can turn your marketing career dreams into a reality.